It may be outside your comprehension, but millions are repulsed by A&E’s anti-Scientology, religious discrimination programming featuring Leah Remini and her cast of a dozen or so ex-members. Your licentious search for shock and horror for ratings and thereby advertising dollars does nothing but appall the thinking American public. Had you done honest and actual research, you would have found a very different story of Scientology and its members. None of the people you feature are Scientologists, and factually never truly were, so they are in no way representative of the Church and this is why the series has no impact on the Scientology religion. Why do you not bother to find out from them? Replace the word Scientology with the word Muslim, Christian, Hindu or Catholic and you would be pilloried, and correctly so. Leah Remini’s interest, as a paid A&E source, is in creating religious hatred to fill her pockets. She’s a professional bigot producing a vindictive, one-sided series that never for a moment sought balance. A&E should be ashamed of fanning the flames of religious intolerance and undermining one of the great freedoms we enjoy. 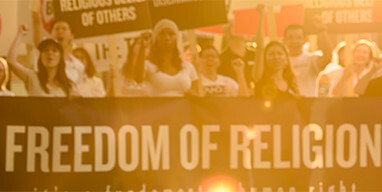 A leading principle in Scientology is that one should respect the religious beliefs of others.